Fatty liver disease is one of the most common hidden diseases in the world. And with the increase of obesity worldwide, the frequency of this disease is on the rise at an alarming rate. A fatty liver is – as its name suggests – when the liver has too much fat on it. Around 25% of adults in the Western world have fatty liver – this is a huge number of people! People who have fatty liver are at a higher risk of developing type 2 diabetes, cardiovascular disease, cirrhosis, and liver cancer. When the fat level in the liver reaches around 10%, the liver stops functioning normally. It is not able to metabolize insulin effectively and affects blood sugar. There are two main types of fatty liver disease. The first – and most commonly known cause – is from heavy drinking or alcoholism. Over time, too much alcohol leads to a fat buildup inside your liver cells. This is called Alcohol-Related Fatty Liver Disease (ALD), or Hepatic Steatosis. ALD is preventable and usually will get better once you stop drinking alcohol. More recently, it has become known that certain diet and lifestyle factors can also lead to a fatty liver – or Nonalcoholic Fatty Liver Disease. This is the most common form of fatty liver. This is when you have fat on your liver, but no inflammation or damage to the liver cells. This version of fatty liver is much more serious. Around 20% of people with fatty liver, have NASH. If you have NASH, it means you have inflammation in your liver, and you might also have damage to your liver cells. This can lead to serious issues, such as fibrosis (scarring of the liver), cirrhosis (severe scarring which can lead to liver failure), and even liver cancer. When it comes to fatty liver, it is not so much what you eat that ends up on your liver, but what your body does with what you eat. When you eat carbs, your body will convert them into palmitic acid. Palmitic acid is a type of fat, and it is the first step to making long-chain fatty acids. Now, because long-chain fatty acids take longer to metabolize than medium- and short-chain fatty acids, the long-chain fatty acids are deposited as fat in the body. This leads us to problem one – an abundance of carbs will lead to fat deposits on the liver. Your liver converts sugar to fat. If there is too much sugar for your liver to process, it will deposit the fat right on the liver. This leads to problem two – an excess of sugar leads to fat deposits on the liver. As you can see – it isn’t necessarily eating too much fat that will lead to fat deposits on the liver. It is important to address fatty liver disease when it is still in the ‘simple fatty liver’ stage before it starts doing actual damage to your liver. There is currently no medication to treat fatty liver disease, and the general consensus in the medical community is to treat it using exercise and diet. The common advice given is to exercise, count calories, and lose weight. The problem with this – as we know – is that most people will try to follow this type of diet, and then fail. Recent interesting studies are showing that when sugars in a diet are replaced with protein (or even replaced with starch) – and the calories remain the same – the metabolism of the liver changes. The liver then starts burning fat instead of creating it. Reducing sugars appears to be an effective way of reversing fatty liver disease, rather than focusing on reducing calories. The best way to treat a fatty liver, then, is with a diet that is proven to control diabetes, obesity, insulin resistance, and hyperlipidemia. In other words – keto (with a few key adjustments). Many people are afraid of the keto diet because it is high in fat. It is understandable that people with fatty liver would be hesitant to try a diet high in fat. 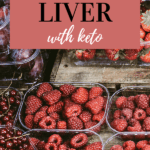 However, once you understand how the liver gets fatty (see above), and how the keto diet works, it starts to make sense. The keto diet switches your body from a sugar-burner to a fat burner. It is the liver that makes the ketones from fat – either body fat or dietary fat. By following a keto diet, you are allowing your liver to burn off the excess fat it has stored, and then it can carry on burning fat from your diet. 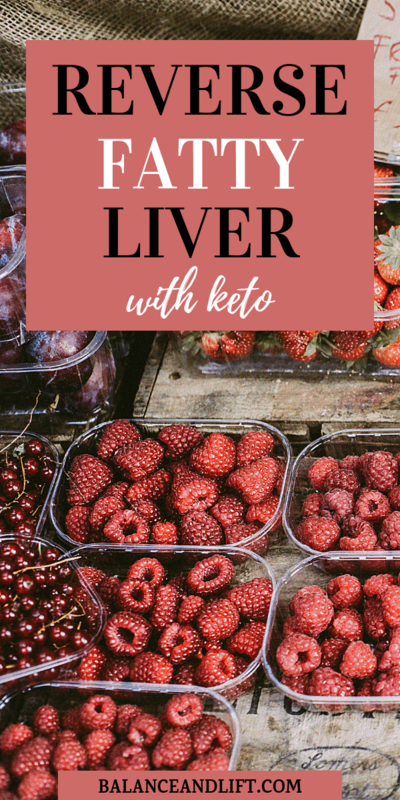 Before attempting the keto diet however, it is important to consult with a medical professional if you have been diagnosed with fatty liver disease. Your liver may not be able to handle this type of diet, or you may have other related health issues that make following the keto diet (i.e. gallbladder issues) potentially unsafe (check out keto diet dangers). The keto diet is high in fat, but it is important to be consing the right kind of fat when you suffer from fatty liver disease. In a study published in 2018 in the Journal of Investigative Medicine (1), most NAFLD patients reported that their diet was high in either carbohydrates and sugars or high in saturated fat. When following with keto diet to help reverse your fatty liver, focus on polyunsaturated and monounsaturated fats – found in foods such as avocados, nuts, and olives. Limit saturated fats to a maximum of 10% of your caloric intake. A common sign of liver damage is constipation. However – it is also quite common to experience constipation when you first switch to the ketogenic diet. Use a combination of high-fiber veggies and adding a lot more fluids to your diet to keep everything moving along as it should. There are certain foods that have been shown to improve the health of your liver. While you are working to decrease the amount of fat on your liver, you can add these to your diet at the same diet. Studies have shown that coffee lowers risk of cirrhosis, reduces the risk of developing cancer, decreases inflammation, and much more! Fruits such as grapefruit, blueberries, cranberries, grapes, and prickly pear are a great addition to liver health. Cruciferous vegetables are always recommended for overall health, but recent studies have shown the vegetables like broccoli and Brussels sprouts are promising as a beneficial food for liver health. The fats from fatty fish are also beneficial for the liver, with studies showing that the fats actually help prevent fat buildup on the liver. Aim for 1-2 servings per week of fatty fish. Wild-caught salmon is the healthiest option.